Rabbit anti Bovine, Canine, Equine, Guinea Pig, Human, Mouse, Porcine, Rabbit, Rat, Sheep, Zebrafish TUBB2A. 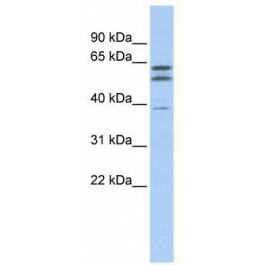 The immunogen for anti-TUBB2A antibody: synthetic peptide directed towards the N terminal of human TUBB2A. Synthetic peptide located within the following region: MAKRSRSEDEDDDLQYADHDYEVPQQKGLKKLWNRVKWTRDEDDKLKKLV. TUBB2A belongs to the tubulin family. Tubulin is the major constituent of microtubules. It binds two moles of GTP, one at an exchangeable site on the beta chain and one at a non-exchangeable site on the alpha-chain.